Just back from a few hours spent at the annual field day at Wyong hosted by the Central Coast Amateur Radio Club. This has to be the big day out for Australian radio amateurs. People came from near and far. It’s a good barometer of the health of the hobby and the local industry supporting it. I was delighted to see – as the first exhibit as you enter – a full display of the Elecraft K-line presented by Gary VK4FD. Only thing missing was a KX3. 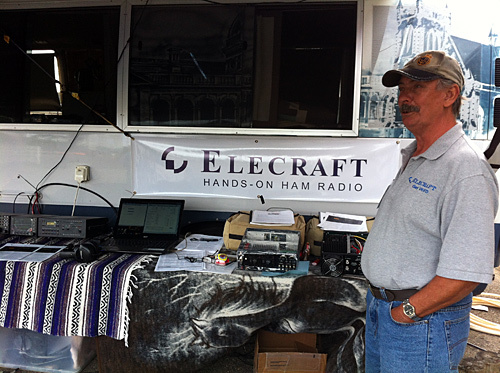 Gary of course is an enthusiast, not an employee of Elecraft. A pretty good indicator of the passionate support the company enjoys. The flea market became pretty busy as the morning progressed, but maybe not as many stalls as previous years. 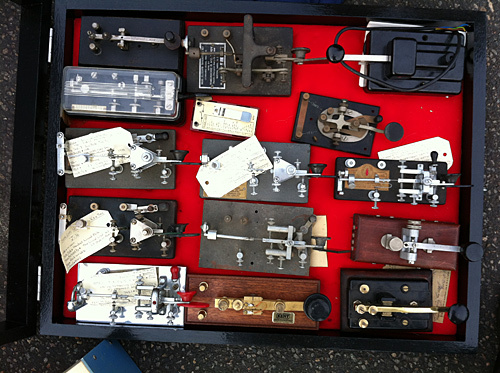 One stall that stood out for me at least was Stephen VK2SPS’s which included his offering of keys and bugs, surplus to his collection as he focuses on homegrown Australian manufactured keys. Eagle-eyed visitors will spot the McElroy bug (top, centre) and an interesting wooden based French military key towards bottom right. Brilliant sunny weather, but not too hot to spend some time wandering about looking for a bargain or three. Also saw an impressive display of homebrew gear from members of the ARNSW Homebrew group.